So, a while ago, I wrote a piece on White interiors. Now it the time for the other end of the scale. 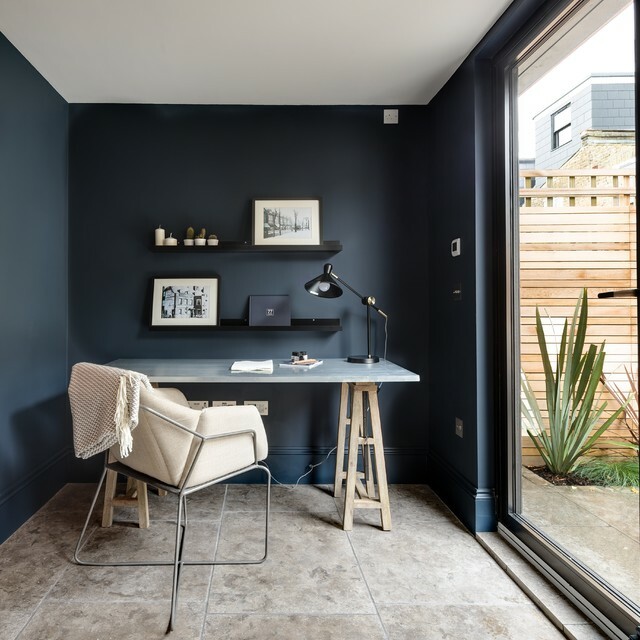 Black interiors are definitely something which has become mainstream over the last couple of years, now with a variety of black paint colours available on the high street. I follow quite a few Instagram accounts and bloggers whose homes contain a large amount of black. Or, at least, very dark blue or grey, and it makes a damn good photo! An image from one of my favourite Instagrammers – thisstyle_rocks. So brave to paint the walls, floors, woodwork and fireplace all such dark tones, and of course, it is styled to perfection! However, my natural instincts just say “No!” and when I just asked Husband the question, “Would you ever let me paint a room black?” and his answer was laughter. Then a shake of the head. I know that dark colours can make a room seem bigger (the opposite of what you – and Husband – might initially assume) and very dark blue can actually be quite a warm colour, creating a cosy feeling room, but naturally I would always associate myself and my home, with light, bright, airy colours. I wonder, when we have a bigger place where I can have a whole room (rather than a lap) to call my “home office”, whether I might experiment with a darker tone. I’d probably be more drawn to an inky indigo blue, or stormy grey, rather than a full on black, but if it were a space Husband would rarely frequent, and maybe a room I would want to make me focus and concentrate on work, rather than the world around me, a dark environment could be what I need. Here’s some inspiration, for you – and me! A bathroom or cloakroom could be a great place to experiment with black and I really like this traditional style bathroom. The striking contrast between the white porcelain and black walls is stunning. The addition of the large mirror, various brass finishes and beautiful pink flowers soften the effect and make it warmer. This library is stunning. The black walls make the artwork and books stand out, and in conjunction with the pale rug and white kitchen further through the house, doesn’t actually look too dark! This vaulted room has a wow factor moment thanks to those dark walls. The monochrome styling keeps the room feeling airy and spacious, and makes the architectural features even more impressive. 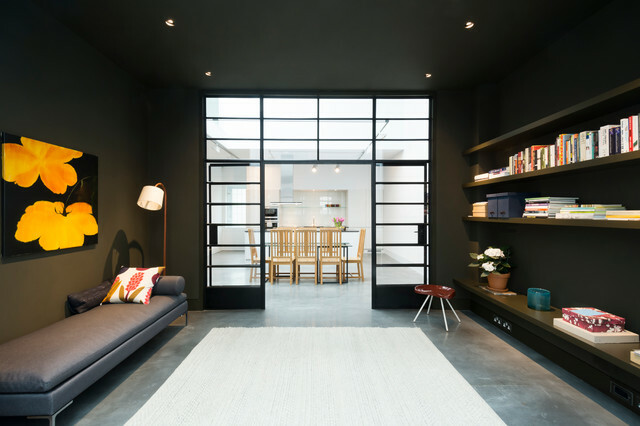 This black painted bedroom certainly makes the most of its Californian sunshine, and the huge doors and big windows break up the expanse of the walls, making the ceiling even more dramatic! I love this scheme; the walnut desk and brass accents really add warmth to the scheme. The large pale rug is also a great touch to bounce the light from the window back up into the room. Imagine having this much space! Another stunning example of a black study. The Moroccan style light fitting and shaggy Afghan style rug gives the room an exotic feel – it would inspire me to keep working towards my next holiday! This home office is in a pod at the end of the garden, which in itself I love the idea of, but I also love the cosy, Scandinavian style. The trestle table keeps things looking casual and the shallow shelves gives room to display some inspirational pieces, without taking up too much space. Photo cred – Justin van Leeuwen, for John Donkin Architect Inc. I think this photo is probably more in line with what I might achieve in terms of space, and using the dark wall colour as an accent, rather than an entire room. The chalkboard paint is a great way of having a built-in memo board for behind your workspace, and the floating shelves leave the desk space free of clutter. So, definitely some food for thought – and ammunition to keep hold of in case of future dream home possibilities! I think I would use black on the walls, but probably not the ceiling too – this might be a stretch too far. The most successful schemes seem to combine black with lighter floor coverings and plenty of decorative accessories – especially in warm tones like brass, pink and yellow – which I could definitely get on board with! This entry was posted in Inspiration and tagged 2017, black, black and grey, dark colours, dark interiors, home decor, home inspiration, home office, Ideal Home, indigo blue, Inspiration, interior design, interior trends, interiors. Bookmark the permalink.